Kurt Dupont is a solution provider who would go out of his way just to ensure he brings out the best when it comes to issues that has to deal with data-driven presentations, data visualization, and digital signage software. He started by working at airports worldwide to set up airport databases and flight information screens. This evolved to became the basis for PresentationPoint. In this conversation, Kurt talks about the use of PowerPoint-based dashboards. Want to learn a new skill, a new program, or do you want to look into self-improvement? You are in luck. Why? Because our friends at Udemy, the leading provider of online video courses has slashed the rates of many of their courses to just $10.99. Many courses that cost more than $200 are now only $10.99. And even better, you can just buy these courses now, and decide to view the courses whenever you want - maybe today, maybe next week, or next year, or when you retire! How is that possible? Because Udemy courses do not expire, and you can access them for a lifetime. Get these Udemy courses at slashed prices! Jamie Garroch is the founder of YOUpresent, a PowerPoint add-in and presentation design agency. YOUpresent provides a suite of off-the-shelf add-ins plus a custom add-in design service for organizations wishing to extend the functionality of PowerPoint or other Office apps. That can be anything from adding a single button to apply a corporate style, to a fully loaded ribbon with custom tools tuned to the organization’s workflow. Known as “extensibility,” Jamie is a passionate evangelist of this relatively unknown productivity feature of Microsoft Office. In this conversation, Jamie talks about his new PPT2GIFa Lite add-in for PowerPoint. Office 2013 programs such as PowerPoint 2013 work with their own Accounts system. Additionally, they also integrate with the Account you use to sign in within your Windows-based operating system. Many options within PowerPoint show up or change depending on which Account you are signed into, and these include your Recent Files list, your connected services, and even the interface color for your program. While these customizations show up irrespective of whether you are running PowerPoint 2013 on Windows 7 or a newer version such as Windows 10 or 8, the process in which you sign in and switch Accounts differs. "College campuses and communities are finding a ready audience among their students who are constantly on their smartphones. They may forget their books, but they rarely forget their phones." If none of the preset Motion Paths effects suit your needs, or if you cannot easily edit them to the way you want, you can easily create your own motion paths. In this tutorial, you will learn how to use PowerPoint's Custom Path option to create your own motion path. Microsoft Office programs, such as PowerPoint 2016 connect with an Account. Additionally, they may also integrate with the Account you use to sign in within your Windows-based operating system, such as Windows 10 or Windows 8. Many options within PowerPoint show up or change depending upon which Account you are signed into; these include your Recent Files list, your connected services, and even the interface color for your program. In PowerPoint, and in other Office 2016 programs you typically need to sign in to a Microsoft Account so that you can access saved settings, customizations, and even some files off the cloud. You typically do this by managing your Account, right inside PowerPoint or another Office 2013 program such as Word and Excel. The Account tab in Backstage view allows you to sign in to your Microsoft Account, and automatically connect to your OneDrive account. In this tutorial, you'll learn how to access PowerPoint 2016's Account options. Applying a preset motion path or even drawing your own custom motion path are not the only high-end tricks you can master. There are several other tricks that can help you become a better PowerPoint animator. The simplest Motion Path trick is to reverse them! This option is very helpful if you want an object to animate using a Motion Path, and then animate it again from the end of the motion path to the beginning! PowerPoint's export options come into play after you have created your slide decks, and are looking for ways to share your slides with others in the most effective way possible. PowerPoint allows you to save your presentation in different forms, that makes it possible for you to view and share on almost any device. Did you know you can create a PDF from your presentation, or export all slides to a video? If you need an old-fashioned way to share, you can burn your slides to a CD. You can also create Word document handouts. Finally, PowerPoint lets you save in so many other file formats. Office 2013 programs such as PowerPoint 2013 work with their own Accounts system. Many options within PowerPoint show up or change depending upon which Account you are signed into, and these include your Recent Files list, your connected services, and even the interface color for your program. While these customizations show up irrespective of whether you are running PowerPoint 2013 on Windows 8 or Windows 7, the process in which you sign in and switch Accounts differs a little in both these Windows versions. In this tutorial, you’ll explore the Account management for PowerPoint 2013 within a Windows 7 environment. 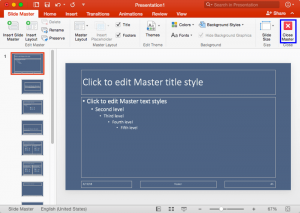 In PowerPoint, the Slide Master influences the layout and look of all slides in your presentation. Make changes to the Slide Master and those changes reflect on your presentation slides. For example, you can apply another Background Style so that all Slide Layouts and slides in your presentation use the updated slide background. In this tutorial, we will explore how you can choose from any of the 12 available Background Styles to apply to the Slide Master in PowerPoint 2016 for Mac.